The Army says it leads from the front. It needs to lead from the front, again, and this time finish what it started 170 years ago. For most of its history, the Department of Defense, and the Army specifically, have been pulled forward on social issues by its civilian leadership. Desegregation, gender equality, and now Lesbian, Gay, Bisexual, Transgender, and Queer (LGBTQ) rights. And as our civilian leadership has pulled us forward we have helped pull the country forward. But there is one issue that the military has let lapse which has had dangerous, far-reaching effects on the country. That is its stance on the Civil War, its relationship with the Confederate Army, and the acceptance of the Confederate battle flag. The Army’s torrid relationship with Civil War history began almost immediately once the last Confederate soldier surrendered in 1865. After the assassination of President Lincoln, the plan for Reconstruction fell to a Southern sympathizer in Vice President Andrew Johnson. Johnson continued the Reconstruction Plan of his predecessor, one that was liberal and equally forgiving to the South. “With malice toward none, with charity for all” was Lincoln’s cry from his 1865 inaugural speech and so there was none. Quite the opposite, in fact. But as Reconstruction wore on it was clear that old had become new again; the old Southern systems and rules of society had returned, albeit now in the legal form of slavery backed by stringent racial codes. The old cast of characters of Southern leadership was once again in charge and not much had changed since before the war. By the time the occupying Federal army returned to their homes and the old Confederate states were readmitted into the Union it was like nothing had really changed. The failure of Reconstruction ensured that the gains made by the North in those four years of bloody war were all but lost. This Civil War historiography began to permeate every facet of teaching and understanding of the war, mainly due to former Confederates writing the bulk of the history of the conflict. The Lost Cause became the default excuse for not only why the war was fought but also why the South lost. Southern society latched on to the ideas of the Lost Cause and have inculcated them deeply into their psyche. The nation preached reconciliation and rebuilding ties between former adversaries and held remembrance ceremonies featuring old grey-bearded veterans shaking hands. The façade of coming together covered up the deep-seeded resentment of the South for losing and allowed them to write the history they wanted to, making themselves look good and attempt to absolve them of blame. And it continues to warp our ideas and views of the conflict today. New scholarship about the Civil War is still tainted with the propaganda of Southern veterans 170 years on. Gettysburg veterans shaking hands across the stone wall at the site of Pickett’s Charge, on the 50th anniversary of the battle. These myths and ideas have infected not only Southern history and culture but the military as well. The US military has a strong Southern tradition stretching back to before the Civil War. After the war was over a good number of veterans joined the new US military and became part of the organization that they previously fought against. Fighting in overseas operations like Cuba and the Philippines these old Soldiers distinguished themselves over and over and continued the Southern traditions of military service and honor. Yet they also brought with them the same prejudices and ideas they had during their time in the Confederate army. Teamed with the ideas of the Lost Cause this turned the US military into a safe refuge for Southern sympathizers which continues to this day. The Army has done its best to be as inclusive as possible when it comes to Confederate veterans and military history. Taking a cue from the government that wanted peace as quickly and painlessly as possible, the Army accepted Confederate veterans into its ranks after the war, identified Confederate service as part of unit lineage, and even recognizes Confederate veterans in the Veterans Affairs system. You can have the VA place a Confederate marker over a relative’s grave with the right paperwork at no cost to you (but at cost to the VA). Partner this disproportional recruiting ratio with the mainly white, Southern officer corps that is also traditionally politically conservative, the continuation of support for a Confederate heritage within the Army has fruitful ground to grow in. If the Army is to lead on this issue again and uncouple the organization from Confederate history there are three things that they must do. These three things are key to not only removing the specter of racism and hatred from our history but is necessary to finally “bind up the nation’s wounds” and finish the war once and for all. The Army as an institution has a sense of history and honor. We recognize unit actions, battles, and campaigns, as well as the bravery and valor of specific Soldiers. There was a conscious decision after the Civil War to identify Confederate military history as part of the overall American military historical narrative. This was in line with the government’s decision to re-integrate the South as fast as possible after the war. Unit lineages were continued into the post-war Army and Southern exploits during the war were incorporated into the overall Army history. While understanding the war in its totality from a historical sense is wholly appropriate, the idea that the United States Army would incorporate the history of units in an army that fought against it for four years and killed hundreds of thousands of its Soldiers is incomprehensible. There are still strong familial ties to those Confederate units that can be noted in other ways, but to formally identify current United States Army National Guard units, with Confederate units flies in the face of the sacrifice of the units that fought against them. The Army should disassociate itself formally with any heraldry or ties to Confederate units that are still recognized in the official rolls. They should have their service records reflect reinstatement into the Army after 1865 and have any battle honors or streamers for their part in the Civil War removed from their official records. The Army puts a lot of effort into its Equal Opportunity programs and tries to ensure that every Soldier is treated with dignity and respect and that they act in a professional, Soldierly manner. There are codes of conduct and regulations that govern the display, support of, and voicing of racist and hateful speech or paraphernalia. These are covered in Army Publication 600-20, Army Command Policy, which governs actions and activities of Soldiers. Two chapters in this policy document, specifically, look at these areas. Chapter 4, titled Military Discipline and Conduct, discusses how Soldiers will act while serving in the United States Army. A specific part of the chapter, 4-12, Extremist Organizations and Activities, notes that “Military personnel must reject participation in extremist organizations and activities.” It prohibits Soldiers from having any involvement in any organization or group that advocates violence against the government or against people of different races, creeds, religions, or national origin. Chapter 6, in the same publication, governs the Army’s Equal Opportunity Program. This program is designed to “ensure fair treatment for all persons based solely on merit, fitness, and capability in support of readiness” and ensures the Army “provide an environment free of unlawful discrimination and offensive behavior.” The policy applies to Soldiers at all times, on and off post, on and off duty, and in all aspects of both their civilian and military lives. As these two chapters note, the Army has clearly defined regulations against participation in extremist or hateful organization and the display of hateful and racist, discriminatory paraphernalia. The Confederate flag, in particular the Confederate Battle Flag has long been identified as a symbol of hatred and racism. Carried and displayed by the Ku Klux Klan, neo-Confederate groups, and ultimately being the symbol of the Confederacy, the display of or support of it is in direct contrast to service under the United States flag. One of the most blatant homages to the Confederacy is the naming of Army posts after Confederate General Officers. These names date back to the World Wars and America’s rush to prepare for conflict. As the wars in Europe raged and it looked more and more likely that the United States would be pulled into them, the War Department began mobilizing and training Soldiers to increase the size of the Army. There was a need for large expanses of land in order to train and the South had a lot of it, close to ports on the coast that would facilitate movement across the Atlantic. The War Department negotiated with state and local officials to purchase the land and depending upon the post, either the local population voted on its name or the Army named it themselves. These locations were in the South and the Civil War was only a couple decades removed so the obvious choice by all was to name them after Confederate heroes. One of the biggest, and probably most meaningful, steps the Army can take to remove the Confederate stigma is to rename these posts. Since they are Federal property it would be fairly easy to do so and would show that the Army is serious about moving forward instead of holding on to a controversial past. The Army could have its heraldry organization put forth names and the Army could vote on which one they like best. It would not only replace the name with one more fitting our values but also would ensure that the Soldiers got a say. A list full of Soldiers who served in the United States Colored Troops during the Civil War, and were awarded the Medal of Honor, would make a very promising and popular alternative. The question then becomes why? Why take the time and effort to literally change Army culture? Southern sympathy and Confederate heritage is rampant amongst the military, and why take any action that may cause controversy or become contentious? The answer is a plain and simple “because it’s who we are.” The Army. 1. Finish what we started. In the months leading up to the surrender at Appomattox Courthouse, President Lincoln worked tirelessly to ensure that the fight to preserve the Union was not done in vain and that the nation would be restored, not as it was but as a new nation of promise, hope, and liberty. He drove Congress to pass the 13th Amendment to the Constitution finally abolishing slavery, and follow-on amendments giving freed black Americans the freedoms they deserved as citizens. He would have, one would hope, have been able to lead the nation through a Reconstruction that was more successful. His assassination prohibited that. The military has fought its share of insurgencies, with mixed results. Winning or losing has come at the price of blood and treasure but the effects on America were negligible. Not so with the Confederate Insurgency. The fight switched from one with armies to one of ideas after 1865 and the North has since lost, badly. The prevalence of Southern sympathies amongst many in service, the inclusion of the Confederate army history into our own, and the handwashing of the dichotomy between our values and those of the Confederacy show just how deep the insurgency has found its way into the military. So, it falls to us, then to finish what we started and fully restore the Union. That means we must fight the insurgency that continues unabated today. And the Army must lead as we did in 1861 to 1865. We must begin by ridding ourselves of the propaganda, heraldry ties, and historical fallacies that link the Army with the Confederacy and link ourselves with the Band of Brothers from the Union blue. Their legacy is our own and we must honor their sacrifice and efforts by finishing their fight. 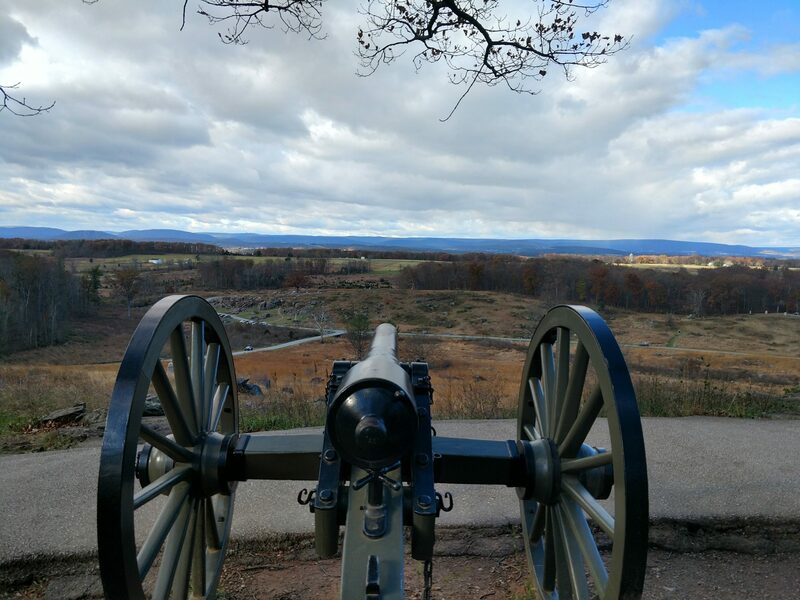 There were still dead from both sides scattered across the battlefield in mid-November of 1863 when President Lincoln made his way up to the little town of Gettysburg, Pennsylvania. The previous year, Lincoln issued the Emancipation Proclamation aimed more at militarily hurting the South than freeing the slaves. But the comments of his Gettysburg Address, short and powerful, would link the idea of Union and ending slavery as co-reasons for continuing the war. What Lincoln said in his barely two minute address established the moral bedrock of the Civil War and the Union cause. Surrounded by citizens from the local area and Union Soldiers, he linked the birth of America, based on the ideas of freedom, to the fight they were engaged in at the time and implored them to not have let those who died during the battle, and ultimately those who died during the war, to “not have died in vain.” His clarion call of giving all of America “a new birth of freedom” set the bar for how he saw America after the war. His words were not just to those gathered on that hilltop in Gettysburg or their contemporaries. Lincoln’s words were for all of us. He recognized that in order for the Union to survive that we would have to extend the freedoms guaranteed under our founding documents to all American, regardless of color, creed, religion, or background. And he spoke to not only the generation fighting then but to the subsequent generations of Americans to come. To us. 3. Because it’s the right thing to do. Imagine you’re a Non-Commissioned Officer or Officer on your way to work on post. It could be Benning or Hood or Stewart or Lee. You drive past the “WELCOME” sign like you do every morning with hardly a glance. Yet, this morning, you see the name. Really notice it. You’ve researched it or saw something about who the base was named for, who they were, and what they did. You know that man and his history. And now imagine you’re African-American. That vignette may seem extreme or tongue-in-cheek but the Army considers itself a profession. Professions have codes of conduct and rules that guide and limit behavior and establish a cultural norm. The Army has our Army Values, steeped in the ideas of courage, sacrifice, and honor. It is anathema for us as a culture or an organization to believe in this code of conduct and continue to accept anything having to do with the Confederacy or its legacy. If we as a profession truly believe in our values, believe what we preach, and want to be taken seriously as an Army Family, then we are obligated to do the right thing and remove the stain of the Confederacy from our organization. The Army has the opportunity, now, to finally bring the darkest and most turbulent time in American history to a close by taking, again, its rightful place as the defender of the Union. She must reject the ideas of the Lost Cause. Reject the hatred and racism of the movement that tore this country in two. She must remove traces of the traitorous Southern army from its rolls, and prohibit the owning or displaying of any rebel flags or symbols. These are things the Secretary of the Army can do. Should do. If the Army is to live up her own values of Honor, Respect, Selfless Service, and Integrity she must take up this fight. The Army models itself as a profession, with each Soldier held to a high standard of professionalism and standards. If the Army is truly going to practice what she preaches regarding race relations, Equal Opportunity, and being a team then she MUST resolve to rid herself of the vile and disgusting specter of the Confederacy and its legacy. It is up to us to make sure that she does this. Not only for those Soldiers who are serving our nation today, sacrificing their lives for the nation, but also for those who have come before and fought for the rights that the Confederacy strove to refuse them. It’s up to us to make sure that Soldiers in the future know the honor and glory of the Union, the sacrifices they made to keep America whole and to ensure that ALL Americans enjoy the freedoms that our founding documents and our service provide. It’s up to us. Now. The time has come to finally win the Civil War.